Lorien’s research focuses on seabird foraging ecology and life history traits in relation to prey availability and local competition with industrial fisheries. She uses animal-borne miniaturized recorders such as GPS recorders combined with pressure sensors, cameras, etc, to determine the at-sea behaviour of several species of seabirds endemic to South Africa, all threatened with extinction. As part of the Island Closure Task Team (Department of Agriculture, Forests and Fisheries) she is currently investigating whether the recent drastic decreases in African penguin numbers, now Endangered, could be reduced by excluding fishing from penguin foraging areas. She wishes to gain an understanding of penguin-prey interaction in relation to ocean-physical processes to optimize the use of the marine resources by fisheries and marine predators and to help refine conservation strategies. 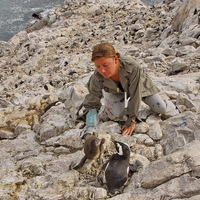 She monitors penguin colonies in Algoa Bay, off Port Elizabeth, with the extensive help of many students and colleagues as well as rangers from South African National Parks. Lorien obtained her PhD from the University of Strasbourg, France, in 2008, spent five years as a post-doctoral fellow at the FitzPatrick and is now a research associate of the institute.